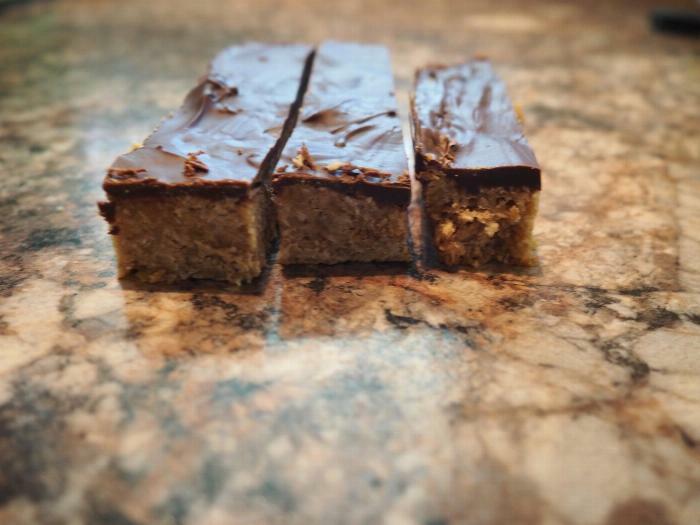 These chewy granola bars are perfect for adding to lunch boxes or taking on the go. No baking required! 1Soften butter in the microwave. 2Add brown sugar, corn syrup and peanut butter. Mix well. 3Add rolled oats, rice krispies and flour. 4With a wooden spoon mix well, making sure to mix right to the bottom of the bowl. 5Press into a greased 9x13 cake pan. 6In a glass bowl, melt chocolate chips in microwave. 7Using a spatula, gently spread over the top of the granola mixture. 8Refrigerate for 20 minutes then cut into slices.